How do I add Facebook comments to my campaigns? Facebook comments are a great way to engage your community and get feedback on a campaign. They add a sense of activity to a campaign and can provide you with valuable insights into why people are engaging with the issues you are championing. Copy your Facebook App ID. 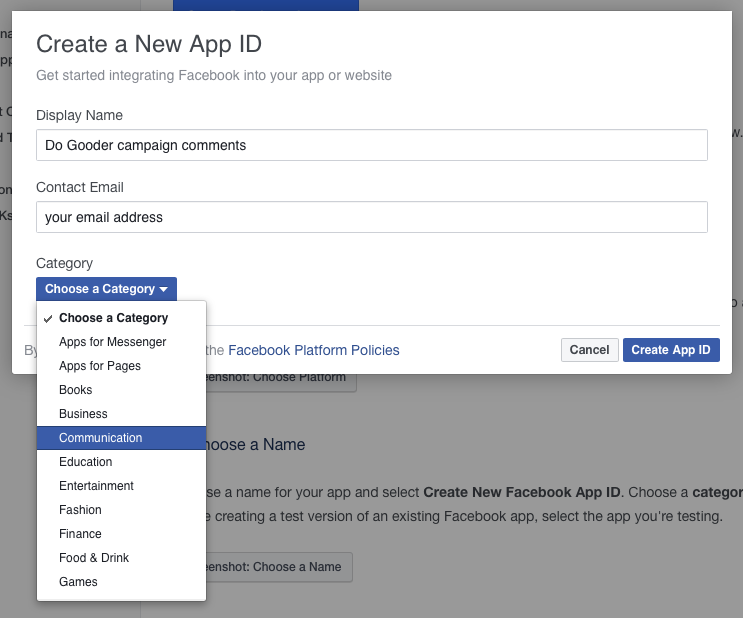 If you do not have one open this page and follow the first 3 steps to create a Facebook App ID. You can stop there as the rest of the process helps you actually create an app which you do not need to do for comments. Once you have created your FB App ID it will appear at the top of the screen, select and copy it. 2. Edit the Do Gooder campaign you wish to add FB comments. Select the Advanced tab, then scroll down until you find the panel below and paste the FB App ID into the field provided. That's it, now save! NOTE: You only need one Facebook App ID for all of your Do Gooder campaigns (the comment threads will be seperated) however you need to repeat Step 2 for each campaign.